Explore the most culturally diverse and beautiful city, San Francisco! Your tour will begin at Fisherman’s wharf, which is filled with some of the best seafood restaurants in the world. While you sit back and relax in the air-conditioned coach you will go on to see and stop off at the many magnificent places like the Vista Point at the Golden Gate Bridge and the Twin Peaks where you will see a panoramic view of the city (weather permitting). Your experienced guide will also recommend and stop off at great photo opportunities along the way, for you to capture them great shots. 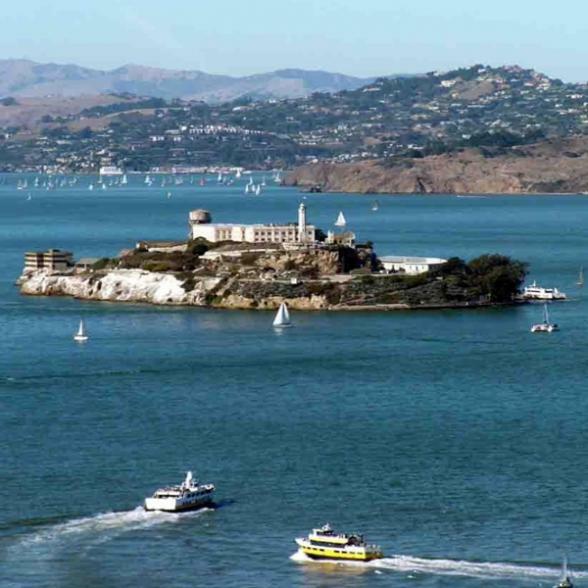 After all that jump on board the Bay Cruise which includes close up views of Alcatraz Island, Angel Island and venture under the Golden Gate Bridge. And learn all about San Francisco with live narration on your cruise. Some of the amazing places you will see are the Civic Center, Union Square, Nob Hill, Cable Cars, Chinatown, North Beach, Coit Tower, Fisherman’s Wharf, Marina District, Palace of Fine Arts, Presidio, Cliff House, Pacific Ocean and Golden Gate Bridge. Tour operates daily at 9.15am and 11.15am. Same details as above, but without the Bay Cruise.